I built this 1968 Chevy Chevelle SS396 convertible by converting a built original AMT '69 Chevorlet Chevelle SS396 convertible kit I bought at a swap meet. After taking the built model apart I stripped it's original green paint down to bare plastic. I then scratch built vent windows from sheet stryrene to back date it to a '68 model. I also filled in the '69 Chevelle taillights and used a Modelhaus '68 Chevelle resin conversion kit for the front and rear bumpers. 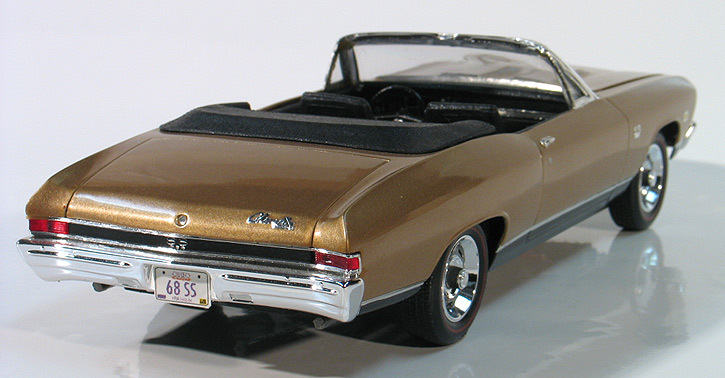 The Modelhaus kit also included a correct '68 dashboard which is different then the '69. I then painted the body with a Duplicolor touch up lacquer paint in a factory matching light gold color with black on the rocker panels. The paint was then polished out with a Micro Mesh polished kit and hand rubbed with The Last Detail wax. Other details include replacing the original AMT kit's rally wheels with the Chevy rally wheels from a Revell '69 Chevy Z-28 kit because I thought they looked more realistic. I also added hand pinstripped red line tires.